Give Your Green Water That Xtra Treatment! Green pond water is a very unsightly, but very common problem among UK ponds. Caused by many microscopic algae spores producing a green tint to the water, a daunting problem to can be faced. However, it is easy to treat when you have the right green water treatment. 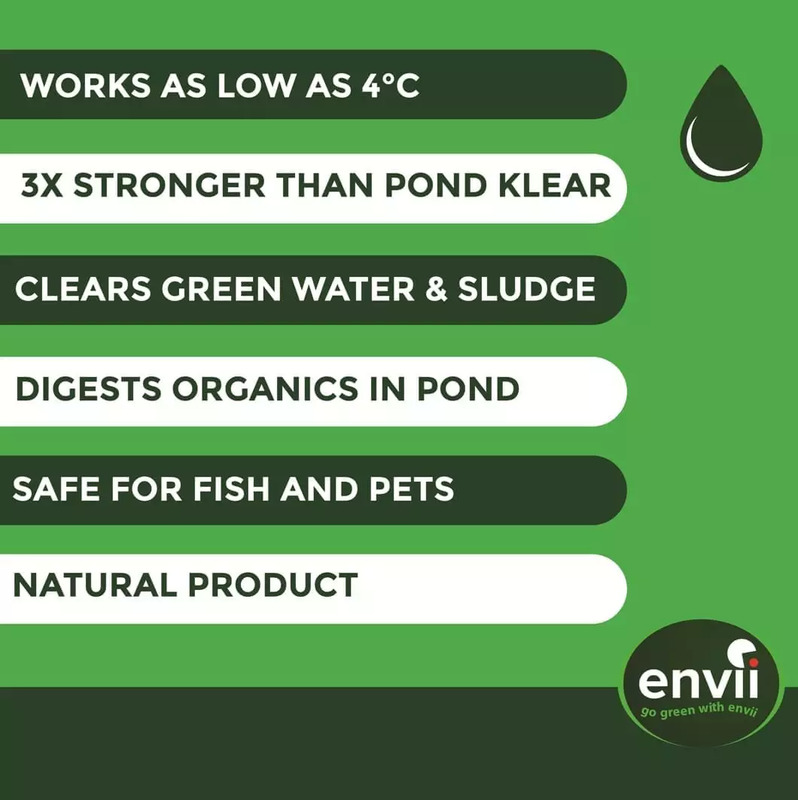 Pond Klear Xtra is a stronger version of our standard Pond Klear and is developed for larger ponds and very badly effected ponds. Containing three time more bacteria than Pond Klear it’s one of the most effective green water treatments available. Working in the same way as Pond Klear, you will be killing two birds with one stone. Targeting the algae spores directly, binding them together and removing them from the pond whilst also digesting the organics that feed the spores creates healthy, clean water for your fish. Most green water treatments only contain a binder that binds the algae spores together and sinks them to the bottom of the pond. This solves the problem quickly as the algae spores are not visible once they have been sunk. However, without the presence of bacteria, the algae spores will soon rise back to the top and your water will quickly turn green. Pond Klear Xtra contains both bacteria and a binder to clear the water and keep it clear. Pond Klear Xtra is mainly used to clear green water, but it is also an extremely effective preventative treatment. When used regularly, Pond Klear Xtra eliminates unwanted organics from the pond to remove the food source available for algae. See the results you could have with Pond Klear Xtra after just 10 days. Before using any bacterial treatment, we recommend checking the pH and KH level in your pond or using Pond Equaliser. It instantly stabilises the water parameters and creates the ideal environment for fish and bacteria. Is this safe for fish? Yes, Pond Klear Xtra is safe to use around fish, pets and wildlife. Will this kill Blanket Weed? No, for blanket weed you will either need Blanketweed Klear or Algae Klear Xtra. Is this safe to use with pond plants? Yes, Pond Klear Xtra can actually increase plant health.